Found as early as the 1930s and becoming a World-Wide franchise, Kentucky Fried Chicken is a fast food chain beloved by many. At its heart is a story of a man who went from rags to riches due to this passion, KFC is much more than simply a fast food chain. 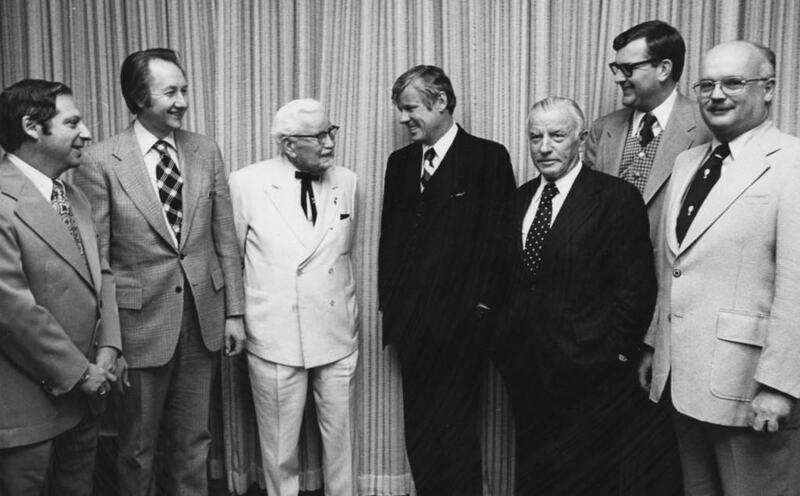 The story starts out with Harland Sanders, who after a rocky childhood and a dozen of different jobs, took over a Shell filling station in Kentucky in 1930. Being at the age of 40 and with a passion for cooking, he started sharing meals with travelers. Who’d knew that in just 7 years his operation would expand into 142 seats and a motel and would later take over the world? Without further adieu, here is the amazing story of KFC told in 10 little known Finger-Linkin’ Facts. 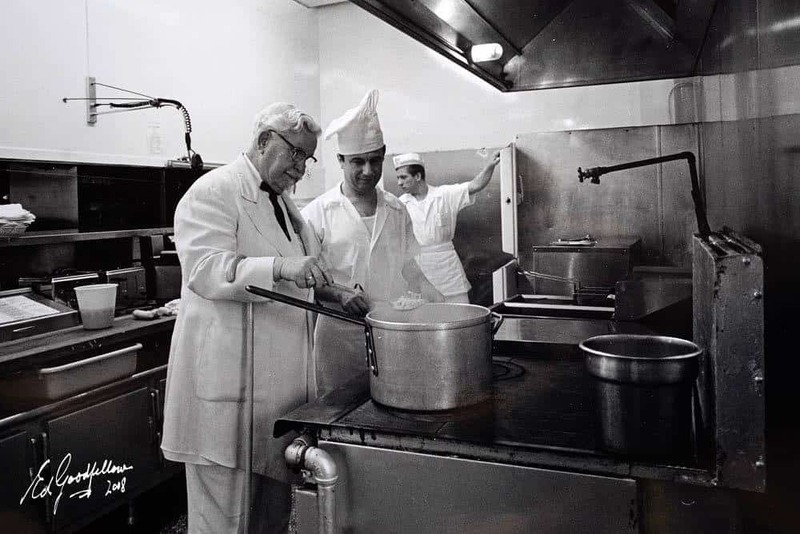 Before expanding to a larger location across the street of the Shell filling station, Harland Sanders used to serve the food he made for his travelers on his own dining room table. 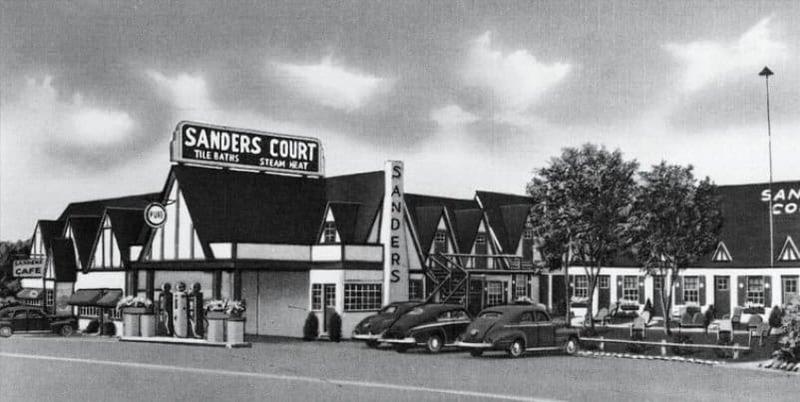 In 1937, as Sanders expanded his operation to 142 seats and a motel, named Sanders Court & Café, he was already becoming a huge local celebrity. His cooking became so infamous that the governor decided to bestow upon him the honorary title of Kentucky Colonel. 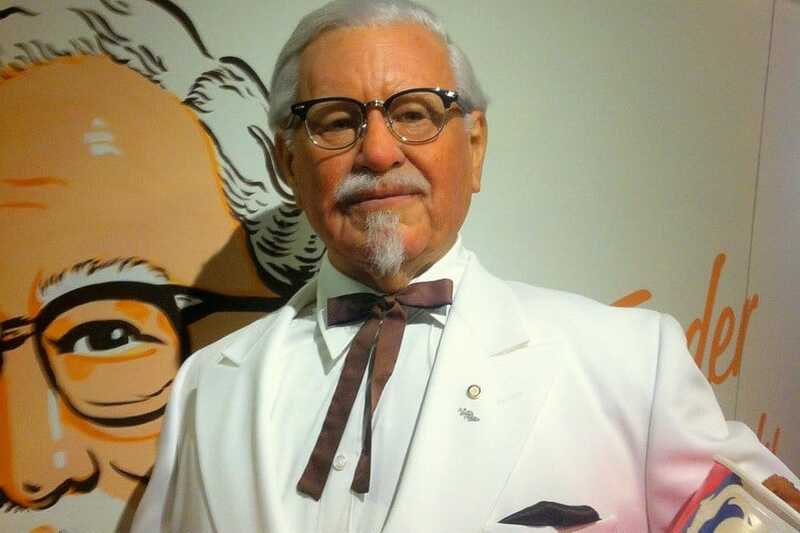 Taking things to heart and even dressing the part, Sanders became the now infamous Colonel Sanders. The creativity of Sanders didn’t stop with cooking. 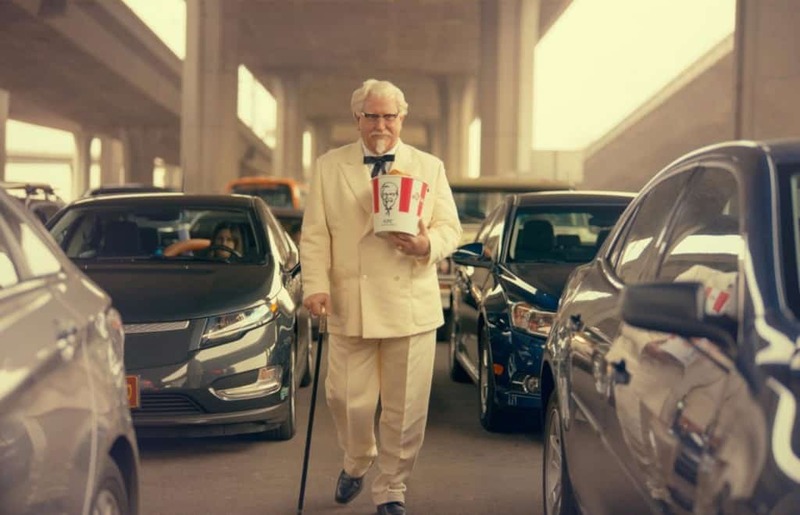 Having a mind for marketing, he sold all of his properties and continued by selling his fried chicken recipe to different restaurants. As he was infamous and with his permission, restaurants used his name and likeness for promotion. 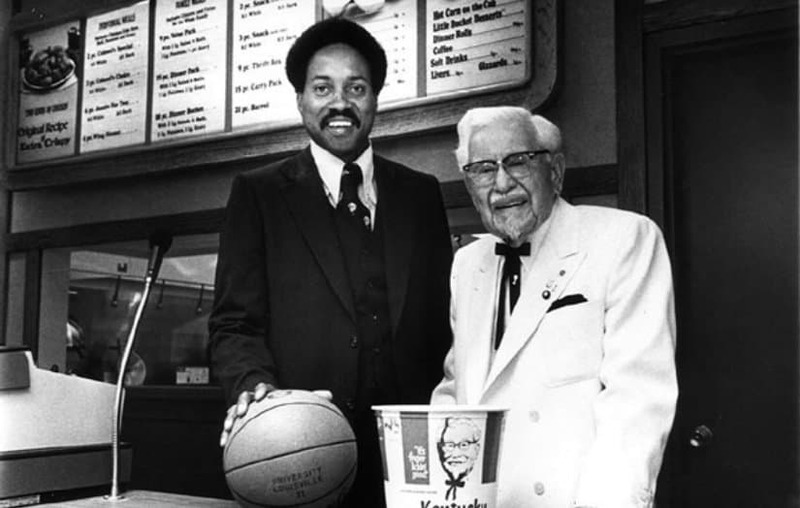 A few years later, the now infamous name of Kentucky Fried Chicken was adopted by all restaurants that sold the product and in 1963, they became the largest food chain in the United States. A year later, in 1964, the now 74-year-old Sanders decided to sell his company to a group of investors for the small amount of $2 million. However, he retained the right to stay on board and be a quality controller, as well as the right to appear in all of the commercials of the company, which turned him into a true celebrity. 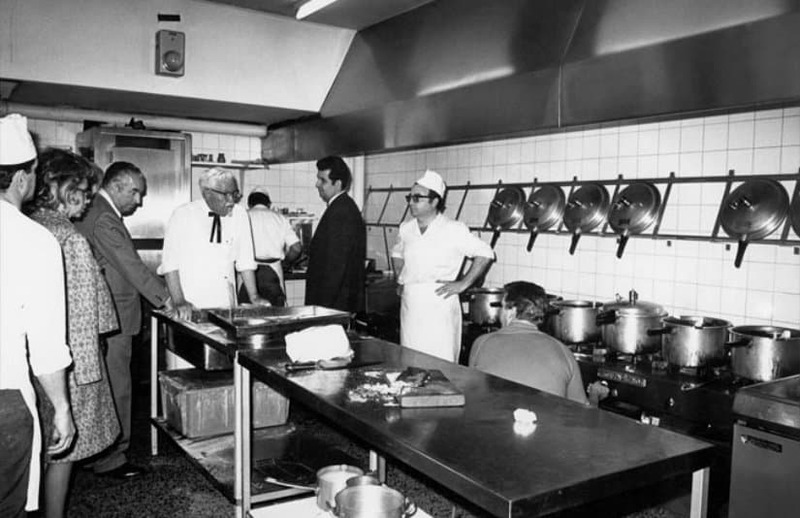 After a few more deals were made and after Sanders death in 1980, with more than 6,000 restaurants in as much as 48 countries, KFC was sold to PepsiCo in 1986. Today, KFC is still one of the biggest fast food chains, but it has definitely seen better days. Smaller chains managed to surpass it and chains half its size manage to earn more money than it. Having that in mind it’s not surprising that Kentucky Fried Chicken is undergoing a huge makeover, adding blackboards indicating what farm the chickens come from, redoing their packaging, décor, uniforms and more. They also plan to add new menu items and healthier choice options. 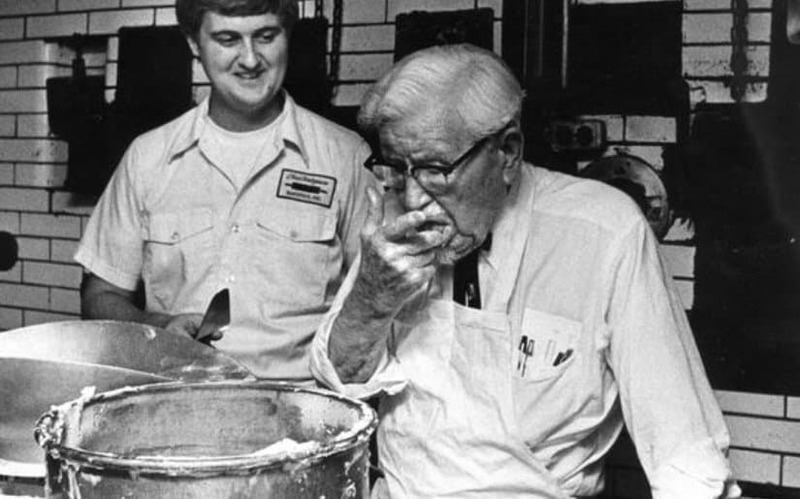 Finalized in 1940, the KFC recipe has become pretty legendary. With 11 herbs and spices and kept in a secret vault, the recipe is thought to be a complete secret to this day. However, many believe that this is simply a marketing plot. Even if the recipe was a secret before, nowadays you can find a lot of homemade versions and recipes online. After a few click, you’ll also find that their official website even lists the ingredients they use in their restaurants. One of the most interesting details about Sanders’ life was his awe for innovation. Released commercially in 1939, the pressure cooker was almost immediately modified by Sanders into an early, home-made pressure fryer. Despite the danger of explosion, the pressure fryer was used exclusively by Sanders, as he believed the resulting flavor was just as good as the one achieved using a frying pan. 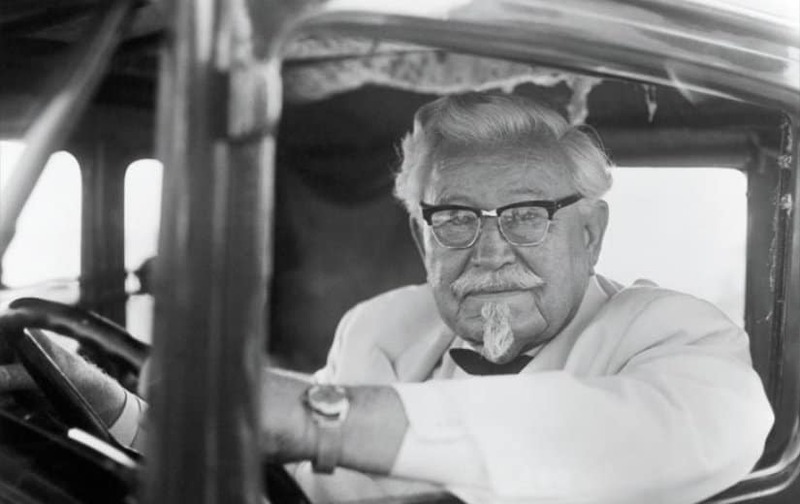 The first ever bucket of KFC chicken was sold as early as 1952, while the first overseas restaurant from the fast-food chain was opened in England. KFC was also the first western fast-food restaurant chain to open a location in China. While we’ve already mentioned that the restaurant is undergoing some changes, one of the biggest changes KFC made in their long history, is the slight change in the recipe. In 2007, KFC decided to phase out trans fat and instead use a zero trans fat soybean oil to cook their original recipe. There are a ton of other interesting facts about KFC, including that their taste slightly varies from region to region and that they have over 300 menu items from their worldwide restaurants combined. However, we’ve decided to close down this list, by mentioning the fact that KFC turned so big that it is now one of the most interesting Japan Christmas traditions. 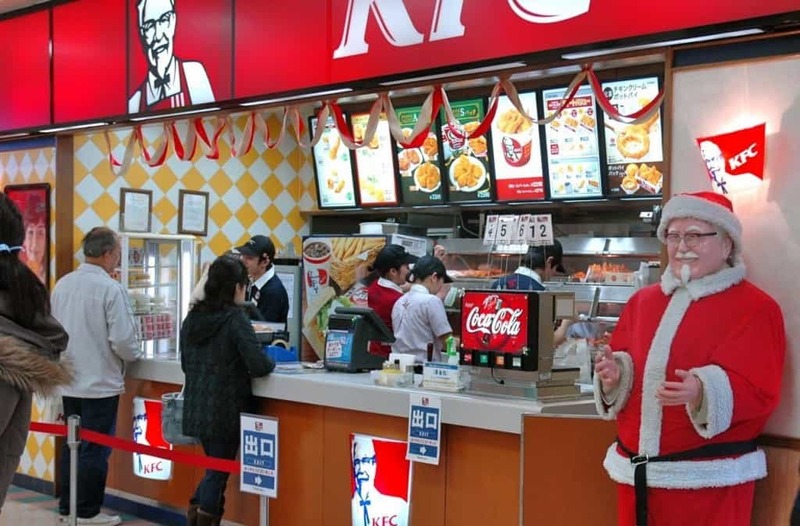 As a very small part of Japanese are Christian, the adoption of the holiday became synonymous with eating KFC. Noted by Kentucky Fried Chicken officials, the chain even offers special Christmas dinner packs, which include cake and Champagne. Japan airlines even serve KFC on selected flights during the Christmas season. Of course, all of this is the result of a smart marketing campaign that started out in 1974 and continues to this day.